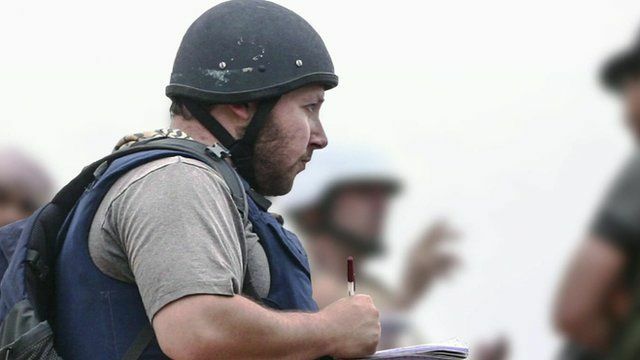 Islamic State 'kills US journalist' Jump to media player Islamic State has released a video online which purports to show the beheading of Steven Sotloff, a US journalist being held hostage by the militants. Steven Sotloff's mother: 'Free my son' Jump to media player The mother of Steven Sotloff, a US journalist being held by Islamic State (IS) militants, has made an emotional video appeal for his release. 'Thoughts and prayers with his family' Jump to media player The "thoughts and prayers" of the US government are with Steven Sotloff and his family after a video purporting to show his murder was released, a White House spokesman has said. Islamic State has released a video online which purports to show the beheading of Steven Sotloff, a US journalist being held hostage by the militants. Mr Sotloff disappeared in Syria in 2013. He was shown at the end of a video last month showing fellow US journalist James Foley being killed. The White House said US officials were checking the reports. BBC security correspondent Frank Gardner describes what the video shows.